Cuisenaire rods are a collection of rectangular rods in 10 lengths and 10 colors, each color corresponding to a different length. Learners can explore whole numbers, fractions, measurement, ratio, area, perimeter, symmetry, congruence, three-dimensional geometry, patterns, and functions. They allow a concrete way of looking a math, and are available in both wood and plastic. We recommend the small group set because, though 155 sounds like a big number, it really isn't. Having that amount is most useful. 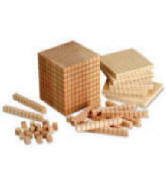 Wood Base Ten Starter Set - The Base Ten Blocks in this box are materials so structured that their use establishes concepts related to the base ten number system. Since each component is a multiple of the next larger by a factor of 10, the blocks form a very good model of our base 10 numeration system. The blocks can be used in a variety of ways. A child's free play with them can establish foundations for understanding place value in written numerals. Models for all operations with whole numbers and decimals can be made. Geometric concepts of area, volume and metric measurement can also be demonstrated. No manipulative can demonstrate more clearly the concept of place value and regrouping. This beginning base ten set includes 100 units, 30 rods, 10 flats, one cube and Teaching Guide. #0231 $59.99 This item is no longer being made, and we only have one set left in stock. 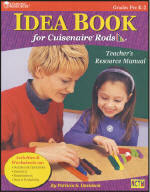 Idea Book for Cuisenaire Rods at the Primary Level - this updated version of the original Idea Book covers beginning rod activities. The set of activities covers the major mathematical standards and is appropriate for any math program. Each page clearly outlines the appropriate age level, materials needed, settings, learning experience and underlying mathematics based on NCTM Standards. 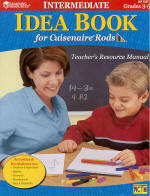 Intermediate Idea Book for Cuisenaire Rods - Take learning with Cuisenaire Rods to another level with this book that explores numbers and operations, measurement, algebra, geometry, data analysis and probability. The learning experiences plus activities are appropriate for various skill-levels and based on NCTM Standards.